Saint Ecgberht (or Egbert) (died 729) was an Anglo-Saxon monk of Northumbria and Bishop of Lindisfarne. As a youth he went on a peregrinatio, or pilgrimage far from home, traveling to Ireland. One of his acquaintances at this time was Chad. He settled at the monastery of Rathelmigisi (Rathmelsigi), identified with Mellifont in County Louth or else in Connaught. His Northumbrian travelling companions, including Æthelhun, died of the plague, and he contracted it as well. Thinking he would die, Ecgberht wept in repentance as he recalled his past sins, and he prayed that God spare him long enough to allow him to atone for the ill deeds of his youth, and he also vowed to remain on perpetual pilgrimage from his homeland of Britain, reciting the Psalter daily and fasting frequently. He miraculously recovered, and kept his vow until his death at age 90. While in Ireland, Ecgberht was one of those present at the Synod of Birr in 697, when the Cáin Adomnáin was guaranteed. After his ordination as a priest, Egbert was filled with zeal for the conversion of the pagan Germanic tribes in Friesland. He began to organize monks in Ireland to proselytize in Frisia; many other high-born notables were associated with his work: Saint Adalbert, Saint Swithbert, and Saint Chad. Ecgberht arranged the mission of Saint Willibrord, Saint Wigbert and others to the pagans. He, however, was dissuaded from this by a vision related to him by a monk who had been a disciple of Saint Boisil (the Prior of Melrose under Abbot Eata). In 684, he tried to dissuade King Ecgfrith of Northumbria from sending an expedition to Ireland under his general Berht, but he was unsuccessful. 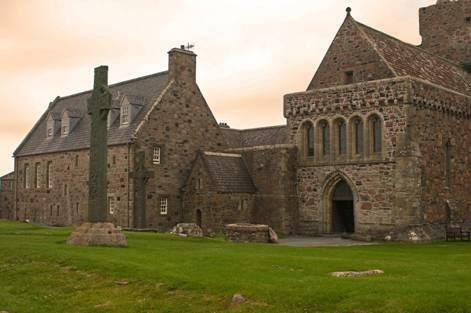 Ecgberht eventually become a monk on the island of Iona, in the distant Inner Hebrides, where he resided from 716 and gently persuaded the monks there to adhere to the Roman form of computing Easter, which had been adopted at the Synod of Whitby (664). He died on the first day that the Easter feast was observed by this manner in the monastery, on 24 April 729. O God, in whose Spirit blessed Egbert, thirsting for salvation, appointed sundry hearts of the faith and sent them forth to preach the gospel; with his merits pleading for us we pray thee guide the hearts of thy servants to thyself, so that being kindled with the fire of they Spirit they may be found steadfast in faith and effectual in deed: Through Jesus Christ our Lord, Who liveth and reigneth with Thee in the unity of the Holy Ghost, one God Forever and ever. R.Amen. O God, Who dost gladden us by the merits and inter-cession of blessed George, Thy Martyr, mercifully grant that we, who ask Thy favors through him, may obtain them by the gift of Thy grace. Grant us, Thy servants, O Lord God, we beseech Thee, to enjoy continual health of mind and body, and, by the glorious intercession of blessed Mary, ever a virgin, to be delivered from present sorrow and partake of the fullness of eternal joy. Through our Lord Jesus Christ, Thy Son, Who liveth and reigneth with Thee in the unity of the Holy Ghost, God, world without end. R.Amen. Lesson from the Book of Wisdom. Blessed is the man that is found without blemish, and that hath not gone after gold, nor put his trust in money nor in treasures. Who is he, and we will praise him? For he hath done wonderful things in his life. Who hath been tried thereby, and made perfect, he shall have glory everlasting: he that could have transgressed, and hath not transgressed, and could do evil things, and hath not done them: therefore are his goods established in the Lord, and all the church of the saints shall declare his alms. Alleluia, alleluia. V. James 1:12 Blessed is he who endures under trials: when he has proved his worth he will win the crown of life. Alleluia. V. Eccl. 45:9 The Lord loved him well and ennobled him: he clothed him about with a robe of honour. Alleluia. My truth and My mercy shall be with him: and in my name shall his horn be exalted. Alleluia. We offer sacrificial gifts in praise of thee, Lord, and in memory of thy saints; trusting that by them we may be delivered from ills both present and to come: Through our Lord Jesus Christ Thy Son our Lord, Who liveth and reigneth with Thee in the unity of the Holy Ghost, one God Forever and ever. R. Amen. Sanctify the gifts we offer Thee, O Lord, and through the intercession of blessed George, Thy martyr, cleanse us by them from the stains of our sins. Blessed is the servant who is found on the watch when his Lord comes: I promise you, he will give him charge of all his goods. Alleluia. Refreshed with food and drink from on high, we humbly beg thee, our God, that we may be guarded by the prayers of him in memory of whom, we have received this sacrament; Through Our Lord Jesus Christ, Thy Son, Who liveth and reigneth with Thee in the unity of the Holy Ghost, one God For ever and ever. R. Amen. We beseech Thee, O almighty God, that those whom Thou dost refresh with Thy sacrament, Thou also grant them, by the intercession of blessed George, Thy martyr, to serve Thee, as befits them, with behavior pleasing unto Thee.